* This maxi dress is made from 2 layers top quality Tulle and one piece of thick satin lining as inner layer, which let the skirt looks very fairy. * Special elastic waist band, very beautiful, right? Just hope to bring some romantic element to the classic tulle skirt. While you place your order, please also tell us what inches your waist is. * Straight down full soft tulle as picture showed. It's not the puffy type. - Fixed waist band available. We offer two options for choice. Just tell us what you favorite. * Many colors for choice, Please check the color chart, and PLEASE ADD THE COLOR NUMBER IN THE NOTE WHILE YOU PLACE YOUR ORDER. * The picture color is sage green. And the skirt length in the picture is 40 inches. If you need other color, please inquiry us. * For The lace top in the picture, please contact us. We can make it for you as well. * This item's processing time is around 4-8 days, and the standard shipping time is around 10 days. For DHL expedited, this shipping time is around 4-6 days. If you need it urgently, please let us know firstly. * All the items are shipped out by EUB's air mail with a registered tracking number. It will take 10 days to arrive. Occasionally it may take longer around 1 month, But in most of cases, it's prompt and safe. 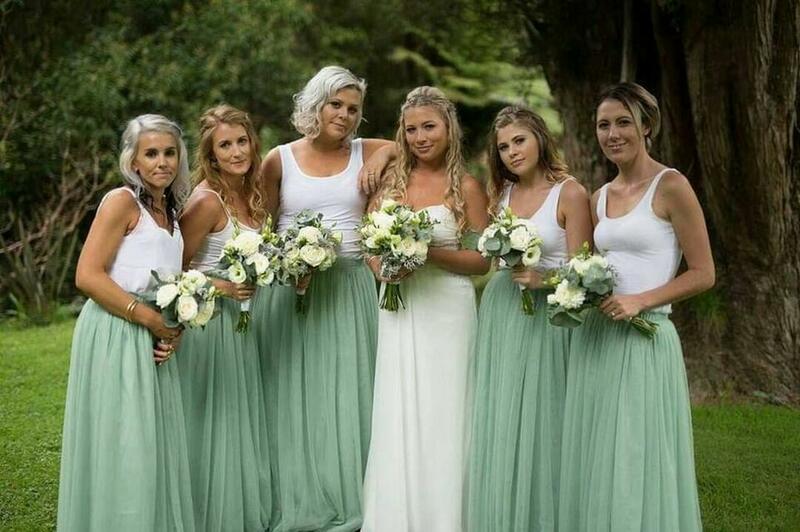 Sage Green wedding, Sage Maxi skirt, Sage Bridesmaid Skirt. Full Floor Length Skirt. Any problem, please contact me by email. I'd love to help.